Was the harm signal robust? Are the alternatives so safe? Do the available studies allow us to evaluate benefit? Should hydroxyethyl starch solutions be totally banned? The choice of which intravenous solution to prescribe remains a matter ofconsiderable debate in intensive care units around the world. Trends have been movingaway from using hydroxyethyl starch solutions following concerns about safety. Butare the available data sufficient to clearly assess the risk-benefit balance for allpatients, and is there enough evidence of harm to justify removing these drugscompletely from our hospitals? The choice of which intravenous solution to prescribe is a question that arises manytimes a day in every intensive care unit around the world. The pendulum has beenswinging away from hydroxyethyl starch (HES) solutions, in part because of therevelations of fraudulent studies conducted by Joachim Boldt . Indeed, the persistence of HES molecules in the body is of serious concernand this issue can no longer be ignored by use of ‘newer’ starches. However,for any intravenous solution (as for any drug), a balance between risks and benefit mustbe considered. After all, diuretics, angiotensin-converting enzyme inhibitors, andbeta-blocking agents can alter renal function in some patients but are also highlyeffective agents in the management of the cardiac patient. Recent studies have provided a wealth of evidence documenting the adverse effects of HESsolutions, but can they justify complete removal of these drugs from the market? Such adecision would seem to require evidence of harm in excess of benefit. Let’s try toassess this balance (Figure 1) given the data provided bythese recent studies. Benefits and risks of hydroxyethyl starch (HES) solutions. The effects of HES solution on renal function in the Crystalloid versus HydroxyethylStarch Trial (CHEST)  were somewhat discordant. The increase in creatinine with HES was relativelyminor and urine output was initially greater, so there was actually less acute kidneyinjury when assessed by the R and I stages of the Risk, Injury, Failure, Loss, andEnd-stage renal disease criteria. There was a greater use of renal replacement therapy,but the difference concerned only 39 of 7,000 patients. The toxicity of HES solutions inthe Volume Substitution and Insulin Therapy in Severe Sepsis  and 6S (Scandinavian Starch for Severe Sepsis/Septic Shock trial)  studies was more apparent, but much larger doses (in some cases well inexcess of recommendations or common practice) were used. Even if we accept the toxicity of HES solutions, the relative safety of other solutionsis not entirely clear. Gelatin solutions have not been well studied, but there do appearto be concerns for renal toxicity . Similarly, there is a renal failure risk associated with excessiveadministration of other colloids . With their high chloride load, 0.9% saline solutions may also cause harm,including an increased risk for dialysis [6, 7]. Finally, hypotonic solutions, such as lactated Ringer’s orHartmann’s solution, may not be desired, and the effects of some constituents,including acetate and gluconate, of other balanced solutions have not been well studied.Although both the CHEST  and 6S  trials provide evidence of comptive toxicity for saline versus HES in salineand Ringer’s acetate versus HES in the same carrier, no available intravenoussolution is free of potential adverse effects. If we are to judge the risk-benefit ratio for each of the available fluids, we cannotlook only at studies evaluating toxicity. HES, like other colloids, is believed toprovide benefit by improving the efficiency of resuscitation . Efficiency, in this context, is the time to reach resuscitation goals andthe volume of fluid required to achieve these goals. To some extent, this was documentedin the CHEST trial , in which the administration of HES resulted in an initially greater urineoutput, a less positive fluid balance, a higher central venous pressure, and lowerrequirements for vasopressor agents. Furthermore, the recent Colloids Compared toCrystalloids in Fluid Resuscitation of Critically Ill Patients study, which included3,000 patients, showed a less positive fluid balance and lower 90-day mortality rates incolloid than in crystalloid-treated patients, and the colloids administered wereprimarily synthetic (Djillali Annane, personal communication). In contrast, the 6S study  could not evaluate efficiency of resuscitation, because patients had largelyalready achieved resuscitation goals prior to enrolment. In both studies, the centralvenous oxygen saturation was 74% at baseline, and the initial lactate level was only 2mEq/L in the 6S study. Thus, the recent trials, though excellent, provide only half the information we need tobe able to assess a risk-benefit relationship. 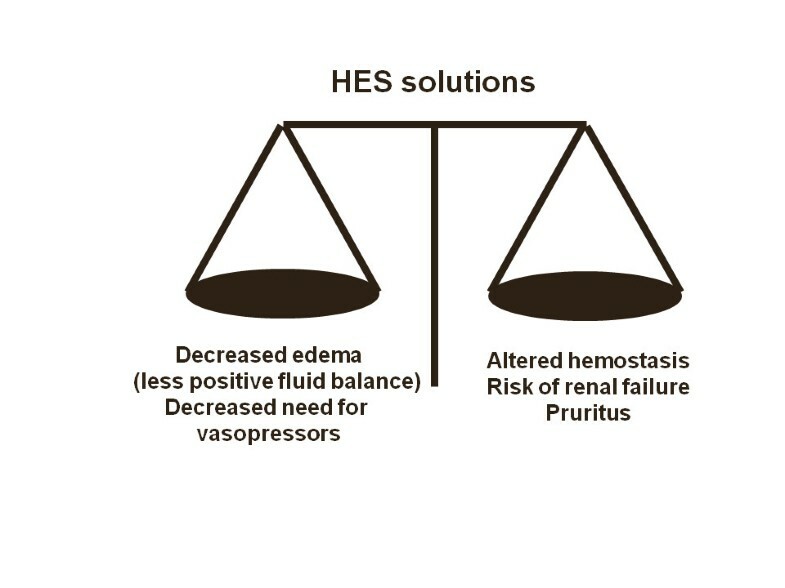 These studies have clearly characterizedthe toxic effects of HES solutions but do not inform on potential benefit, except todemonstrate that giving fluids to already-resuscitated patients does not provide any!None of the intravenous fluids currently available may be entirely safe, especially whengiven in large amounts. All fluids should be considered as drugs, and no drug isrisk-free. Indeed, one can consider that even oral fluids have their risks: beer, wine,and non-alcoholic beverages, such as coffee and sugar-containing beverages, should allbe taken only in moderation, and even water can be harmful if taken in excess. We believe that decisions about intravenous fluid therapy should be individualized onthe basis of the available evidence and the clinical context. Clinicians must definitelybe aware of the harmful effects attributable to HES, and use of these solutions inpatients with sepsis or in bleeding patients should be undertaken only with extremecaution and only when the benefits for the individual patient are expected to exceed therisks for that individual. Eliminating these solutions completely, on the other hand,prevents their use even in situations in which they are judged by physicians to have apositive benefit-to-risk relationship. We believe that the US Food and DrugAdministration has made the right decision in leaving the current HES solutionsavailable but making specific recommendations regarding restricted use of thesesolutions in certain groups of patients and adding a ‘black box’ warningabout risks of excessive bleeding . This approach represents good regulatory medicine because it does notimpinge on provider autonomy but ensures improved patient safety. We hope the EuropeanMedicines Agency will take a similar view. J-LV declares that he has no competing interests. JAK is a consultant for and hasreceived grant support from Baxter (Deerfield, IL, USA). AS has received consulting feesfrom Baxter. MGM and his institution have received consulting fees from AQIX (London,UK), his institution has received grant support from Fresenius Kabi (Bad Homburg,Germany), and he has received lecture fees and travel support from Baxter, B. Braun(Melsungen, Germany), and Fresenius Kabi. J-LV drafted the article, which was revised by JAK, AS, and MGM for critical content.All authors read and approved the final manuscript.